This unit begins with background knowledge vocabulary and standards based study questions with correct answer suggestions provided at the end of the unit. It also contains one educational video and classroom activity on the process of mummification. The importance of the Nile River for farming, food surplus, transportation, trade and communication is explored. Polytheism and Monotheism are compared and contrasteS. 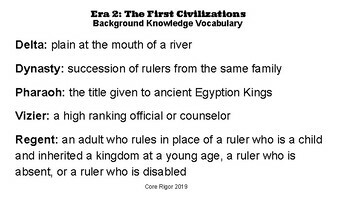 The role of the pharaoh is an important part of this unit with the accomplishments of Djoser, Thutmose III, Akhenaten, Ramses the Great, Tutankhamen (Tut), and Cleopatra cited. The highlights of the Old, Middle, and New Kingdom are compared and contrasted. 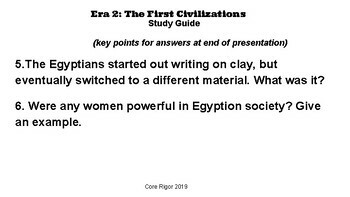 Early design and technology are explored through the pyramids, Egyptian art, hieroglyphics, papyrus and the classification of Southern, Central and Northern African rock paintings. 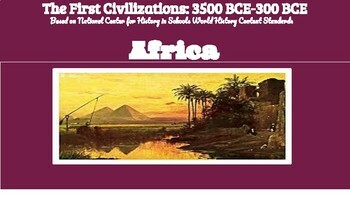 The presence and influence of the Bantu and the Nok people are highlighted as well as the kingdom of Kush and the cities of Axum and Carthage. The unit concludes by citing the importance of oral traditions in African culture. 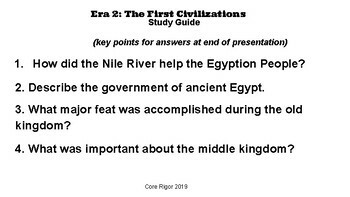 A timeline/study guide chart of the accomplishments during the Old, Middle, and New Kingdoms with Pharaohs charted is also included.